Fashion For Women Over Fifty: Aging Gracefully With Style & Trendsetting Fashion For Baby Boomer Women! Trendsetting Fashion for Baby Boomer Women! 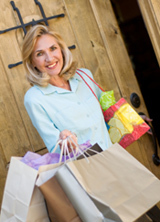 Style and fashion for baby boomer women is more trendy than ever. There’s no doubt that fashion for women over 50 and the art of aging gracefully are a big part of the idea behind 50 is the new 40 , as many women turning 50 exemplify. But settling on a fitting style and current fashion for baby boomer women can still present a challenge. Yet we’ve all seen them. Walking down the street or shopping in the mall, we come across an absolutely stunning 50, 60, or 70 year-old woman. They are head-turners even in their golden years! What is it that these women have that makes them so uniquely attractive? What fashion tips can you use? What about skin care for aging skin? Suggested makeup tips for mature women may surprise you. Turning fifty doesn’t necessarily mean you wake up one morning and find your jeans don’t fit, your cleavage is a little farther off, and you can suddenly see more of your scalp (with your glasses on, of course!) It can, however, feel that way! And fashion for baby boomer women or the mental image of aging gracefully definitely doesn’t mean high collars and muted colors any more! We’ve all heard the same advice on the “most appropriate” way for women over fifty to dress. “Wear loose clothing”, “Cut your hair short”, and “avoid trendy”. Fortunately those suggestions are becoming less and less appropriate for women. Life after menopause isn’t nearly as scary as it used to be!! Our bodies do change, but fashion for baby boomers doesn’t have to mean sackcloth and ashes! And who can forget the timeless beauty and classic style of women like Jaqueline Kennedy Onassis, who represented the epitome of simple elegance in fashion for women over fifty and exemplified aging gracefully. Not only were these women beautiful as twenty-somethings, but time has provided them with a depth, a sense of humor, and a self-assurance that is absolutely magnetic. Chic fashion for women over fifty is alive and well! Part of the persona is a sense of experience and assurance…women who are lifelong learners, love to travel and enjoy every minute life gives them. Got a favorite classic woman who inspires you? Contact us and maybe we’ll include your comments!